2 How does the ASUNA 4200 differ from other ASUNA bikes? 7 How comfortable is the ASUNA 4200 bike? 8 Is the ASUNA 4200 bike difficult to assemble? 9 What do users say about this bike? Designed to make exercising at home a simple, effective and comfortable experience, the ASUNA 4200 has everything you need to make cycling at home a real joy. Made from commercial grade steel, the ASUNA 4200 Upright Bike is compact, yet very robust and designed to last years. Read the full review here, to find out more about the features of this bike and how it compares to the other bikes in the ASUNA range. How does the ASUNA 4200 differ from other ASUNA bikes? The biggest difference is that this bike is an UPRIGHT bike while the other bikes in the ASUNA range are spin bikes. The ASUNA 4200 allows users to cycle in an upright (back straight) position and therefore might be best suited to those who want to avoid back and neck strain and discomfort. It also has a monitor so you can easily track your workout stats such as time, distance, speed etc. Spinning bikes such as the ASUNA 4100 tend not to include monitors. 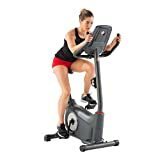 See our BUYING GUIDE for more information on the difference beween upright bikes, spinning bikes and recumbent bikes. SUNNY Health and Fitness are one of the fastest growing companies in the fitness sector and have developed an excellent reputation for creating ‘gym quality’ exercise equipment which is also suitable for home use. The 4200 bike is part of the ASUNA range developed by SUNNY. The ASUNA range consists of high quality exercise products similar in build and structure to those you would find in a commercial gym, for a fraction of the price! LCD monitor displaying time, distance etc. The frame is made from heavy duty steel, built to withstand years of cycling! The bike is therefore heavy and sturdy. This is a major benefit as it means the bike should not move or slip during a workout. Although it comes with handy transportation wheels that should enable the bike to be moved freely, some users have reported that the weight of the bike makes it tricky to move it around freely. This frame accommodates most cyclists and a range of heights and builds, although some users have advised that it is not suitable for those under 5’2″. The ASUNA 5150 bike is of higher specification than this model and provides the most generous allowances for taller/shorter individuals and accommodating heavier users. This ASUNA 4200 has a user capacity of up to 265 lbs. One of the biggest advantage of buying the ASUNA 4200 bike is that it comes with a great, yet simple, digital monitor. You can easily track distance, time, speed, calories, watts and heart-rate during your workout. There is a pulse reading monitor conveniently located on the handlebars, so you can easily ensure you are exercising at the right intensity. 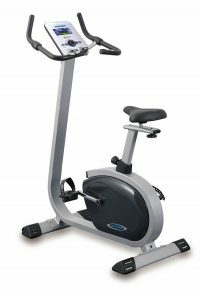 This ASUNA 4200 exercise bike uses a belt drive mechanism for the ultimate in quiet pedalling. While belt drive mechanisms don’t quite feel as natural as chain drive mechanisms, there is less maintenance and greater durability. How comfortable is the ASUNA 4200 bike? The pedals are designed for comfort, and are generously sized, with adjustable foot straps. when circulation is cut off! The handlebars are padded and slip free allowing users grip comfortably in a variety of positions. The handlebars cannot be adjusted to a higher or lower position. 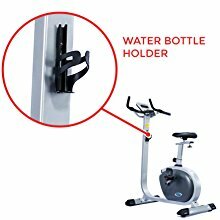 There is also a conveniently placed water bottle holder located on the frame. Is the ASUNA 4200 bike difficult to assemble? The ASUNA 4200 Exercise Bike comes partly pre-assembled with a shipping weight of 112lbs. Users have reported that although full instructions are provided, the bike is is quite complex to assemble and that a minimum of two people would be required to put the bike together. 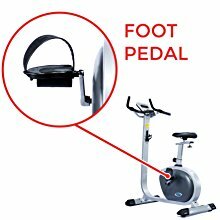 The ASUNA 4200 Exercise Bike has convenient transportation wheels attached to the bike so once assembled, it can simply be moved into a suitable location. What do users say about this bike? Sunny Health and Fitness provided a 5 year structural guarantee and a 180 day manufacturer’s warranty on parts and components. In this range, the ASUNA 4100 bike is closest in specification, but it is a spinning bike, which is a completely different cycling experience. The ASUNA 5100 Magnetic Bike and the ASUNA 5150 Magnetic Bike are also in this range and are new on the market for 2017. Both have slightly higher specifications that the ASUNA 4100. The ASUNA 5150 is a ‘top-of-the-range’ bike with considerable adjustability and caters for cyclists of all shapes and sizes. Both these bikes use magnetic resistance technology (instead of the felt brake pad tension). Magnetic resistance is believed to be a smoother and more reliable option. The ASUNA 4200 Exercise Bike is a mid-range bike, that has a solid build that one might expect from a more expensive bike. It comes at an affordable price, with features designed to provide a comfortable and simple exercise experience. Due to the shipping weight of the bike (around 119lbs), this bike could be be difficult to move into upper floors and apartments. Convenient transportation wheels are provided however, so once it has been assembled, it can be moved into the correct location. Users have like the sturdiness of this bike, and feel it has a long-lasting quality to it. The heaviness of the bike can make it difficult to move around though. Assembly of the bike appears to be the biggest issue, and two people are recommended to put this together. Overall, a solid choice, designed to last, with both comfort and stability as its greatest features.